Enjoy the scenic route and forget traffic jams with two tailored itineraries devised exclusively for O’Reilly’s day-trippers and overnight guests. Swap the sand and surf for waterfalls and whimsical rainforest vistas at our family owned Retreat and enjoy the journey via country roads less travelled. Keep a watch for like-minded Cadel Evans folk sharing this popular stretch of winding bitumen through Condong and Nobbys Creek; arriving into ancient Gondwana rainforest. Pit stop at iconic Natural Bridge, formed by a waterfall cascading over the basalt cave, and accessed on foot via a short one kilometre subtropical circuit. Descend clockwise to the Natural Bridge rock arch while spotting resident paradise riflebirds, green catbirds and wompoo fruit-doves above. Pass through the Numinbah Valley to Hinze Dam (near Advancetown) – the main drinking water source for the entire Gold Coast region. Grab a seat on the terrace with a hot brew at View Café with vistas as far as the Pindari Hills. Later stroll the landscaped pathways lining the dam and keep watch electric powered boats and fisherman reeling in their catches. Don’t miss the Clagiraba Road left turn en-route to quaint Canungra, once a timber and logging town in the early 1900’s. Nowadays the perfect place for bespoke gifts, nik naks and coffee houses galore. Stroll the main street for country wares, unique fashion and homemade goodies from the Visitor Information Centre like local award winning rosella jam, raw honey and roasted macadamia nuts (yum)! Enjoy a casual lunch in the Canungra Valley foothills surrounded by eight acres of grape vines at O’Reilly’s Canungra Valley Vineyards. Choose between an a la carte menu on the verandah of Killowen – a historic Queenslander – or creek side on the manicured lawn with a pre-ordered picnic basket or cook your own barbeque hamper. Grab a selfie with resident alpacas and fresh water turtles while the kids enjoy a game of backyard cricket before embarking on the final 45-minute leg up Green Mountain (stopping at Kamarun Lookout) to O’Reilly’s Rainforest Retreat. 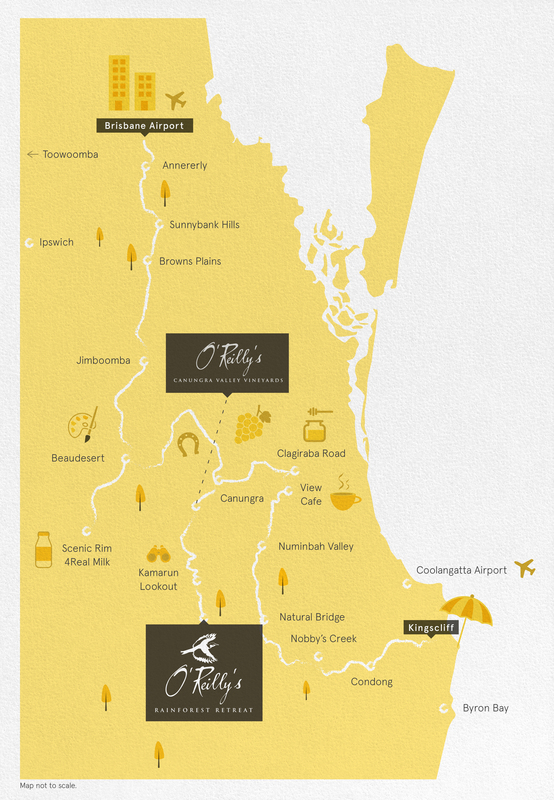 Enjoy your journey to O’Reilly’s Rainforest Retreat just as much as the destination! Watch this video for a sneak peek at some of the highlights. Avoid southbound highway traffic and detour to our Retreat via the ‘burbs of Annerley, Sunnybank Hills, Browns Plains and through country Jimboomba. Complement your true-blue rural experience with a trip to the Beaudesert Saleyards (open most Tuesday and Saturdays) to attend a real working auction, or rather tour a nearby working robotic diary farm at Scenic Rim 4Real Milk (bookings by appointment only). Immerse in the agricultural township of Beaudesert at The Big Pumpkin roadside fruit and vegetable shop or at The Centre for all the latest exhibitions showcasing artists from across the region. Grab a coffee and say g’day to Sonya at Bean To Café (open 365 days of the year) and enjoy a dragon fruit bowl at the Main Street Health Bar. Scoot to Canungra like a local via Beaudesert Nerang Road (near Biddaddaba), winding past state of the art equine centres and dreamy acreage properties galore. Stroll the main street for country wares, unique fashion and homemade goodies from the Visitor Information Centre like local award winning rosella jam, raw honey and roasted macadamia nuts (yum)! 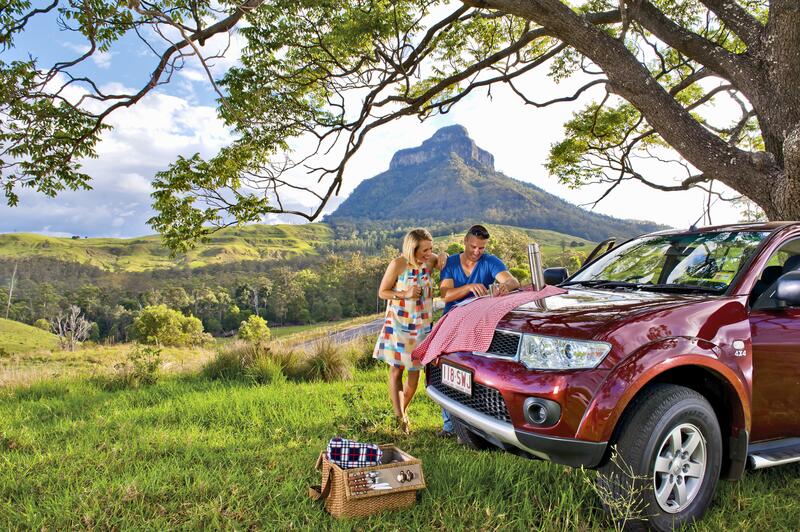 View more itineraries and explore the Scenic Rim. Image from Visit Scenic Rim.